Washington citizens give a damn about public records — as proven by the stunning response to legislative efforts to shield their records from public view. Congratulations, readers. Washington residents across the state raised a big — and angry — ruckus to halt a shortsighted, anti-transparency bill. And the outcry helped change the mind of Gov. Jay Inslee, who demurred earlier in the week during an MSNBC interview, saying the Legislature had the votes to override his veto. Consistent with his established commitment to open government, Inslee vetoed Senate Bill 6617 Thursday evening after brokering a hard-fought detente between legislators and plaintiffs in an open-government lawsuit. That’s not where he was headed last week, he revealed in his veto message. “Though I expressed concerns about the outline of the bill, I did tell legislators I would let the bill become law if they delivered it with enough votes to override a veto,” he said. Well they did. 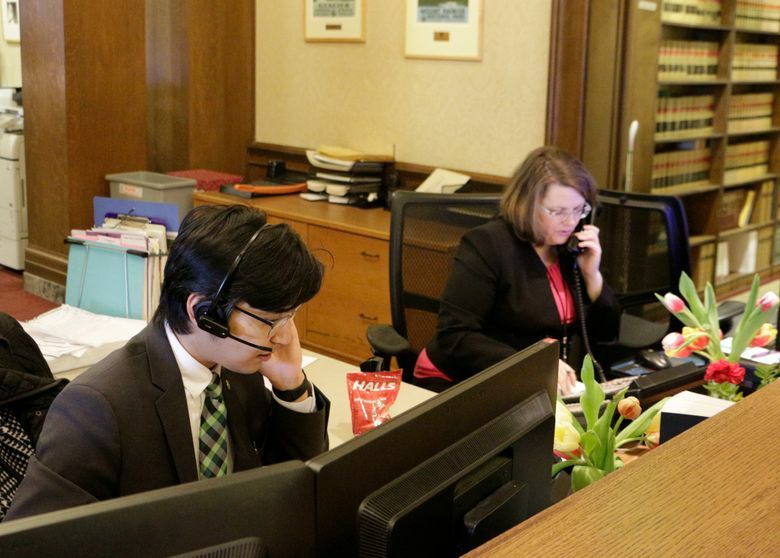 And though it was disappointing to read about his wink to lawmakers on an open-records issue, Inslee got to the right place — thanks to motivated information-loving, justice-seeking Washingtonians. What led up to that decision was a sight to behold — phones ringing off the hook in the governor’s office, scores of emails to lawmakers that readers copied me on and others seeking clarification on the editorial board’s criticism. In this era of the disaffected voter with discouraging political news pouring out of the highest office in the land, the muscular response of Washington citizens moved to make a difference — and actually making one — is incredibly encouraging. Every person who emailed or made a call should be very proud. As of 4 p.m. Thursday, the governor’s office had received 12,500 emails and 6,300 calls from citizens, urging the governor’s veto. About 100 citizens pasted 49-cent stamps on letters to the governor. Let’s pause for a moment and appreciate the gubernatorial staff and legislative aides who found themselves in the path of the deluge. Bless them. Democracy is sometimes difficult, but they were an important part of this process. The phones started ringing Feb. 23 when leadership of both parties in both houses demonstrated callous disregard for the public process by introducing and rushing Senate Bill 6617 through floor votes and to the governor within 48 hours. No actual hearing, no floor debate. That egregious action stirred the sleeping giant of Washington’s historically populist inclinations — sensibilities that birthed, by initiative, the top-two primary in 2004 and the Public Records act in 1972. The number of calls and emails expanded exponentially after The Seattle Times and a dozen other state newspapers from Bellingham to Yakima to Walla Walla and Spokane to Vancouver ran front-page editorials on the issue Tuesday. It was an unusual moment for Washington newspapers, which urged all their readers to do two things: Ask the governor to veto the bill and ask their lawmakers to stand down and not override the veto. Lawmakers, whose contact information was also published, got a ration of citizen fits over their hasty public-excluding actions. And that’s what happened — but only after the governor and his staff negotiated an agreement. Lawmakers who came to their senses agreed that they would stand down and not override the governor’s veto. Meanwhile, plaintiffs in the lawsuit by 10 media organizations, including The Associated Press and The Seattle Times, agreed to join a request that the judge grant a stay of his ruling’s enforcement while legislators appeal the ruling. That only stops the clock on the Legislature having to provide requested documents. It does not affect the news organizations’ robust pursuit of the case. In separate letters to the governor, both sides agreed to work collaboratively with other interested parties to resolve their public records differences — transparently. That will be interesting to watch. The lessons here? Lawmakers should never again try to rush through a bill like that. Imagine, no public process for a public-records bill. Second, media companies, such as The Seattle Times, the News Tribune of Tacoma and The Herald of Everett, remain important vehicles for holding elected leaders accountable. And, the people? Well, the people of this state prove they give a damn. How exquisite. CORRECTION: In my Tuesday column, I erroneously reported that Tuesday’s editorial was the first to be printed on the front page of The Seattle Times in 110 years. A sharp-eyed reader sent an example of a front-page editorial published in the 1930s and a further check showed others in that era. So, I need to revise my statement: In the memory of our publisher, Frank Blethen, who has worked for the company for 50 years, Tuesday’s was the first front-page editorial.